We’re dropping a different specialty beer EVERY THURSDAY in December. 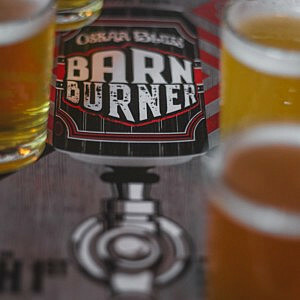 Don’t miss your chance to try these RARE brews outta the OG brew barn in Lyons, CO. Available in Boulder, Longmont, and Brevard taprooms only. JANUARY 3: Interstate SMaSH Express Enigma, 6.9% ABV– A double dry-hopped, heavily Enigma-infused SMaSH (stands for “single malt and single hop”) named after our favorite CO rock band, Interstate Stash Express. Root Shoot Pale malt plays nice with a LArGE amount of Enigma, the newest hop varietal from Australia. Enigma shows off with flashy notes of raspberry pinot gris and mandarin orange in this month’s ISE. We use a first wort hop addition, then a second whirlpool addition PLUS two dry-hoppin’s during fermentation. JANUARY 10: Roterbart Super Helles, 5.8% ABV – is based on the Helles by Brewer Chris Devan. This version is inspired by the EdelStoff beer by Augustiner in Munich. It uses Pilsner and Munich malt from Ireks in Bavaria and German Hallertauer Mittelfrueh Hops. It’s a perfect Bavarian lager for the colder months! JANUARY 17: Interstate SMaSH Express Idaho 7, 6.9% ABV– A double dry-hopped, heavily Idaho 7-infused SMaSH (stands for “single malt and single hop”) named after our favorite CO rock band, Interstate Stash Express. Root Shoot Pale malt plays nice with a LArGE amount of Idaho 7, which was developed by Jackson Hop Farm in Wilder, ID, and first released in 2015. Idaho 7 brings pungent tropical fruit and pine character in this month’s ISE. We use a first wort hop addition, then a second whirlpool addition PLUS two dry-hoppin’s during fermentation. JANUARY 24: Dry Times IPA, 6.5% ABV – This West Coast Style IPA uses Pilsner malt and flaked rice to create a dry and crisp malt profile that has a huge Mosaic hop whirlpool addition plus a massive dry hop addition of Simcoe, Galaxy, Enigma and Strata. JANUARY 31: Use the Schwartz, 5.8% ABV – Translated as “black beer,” Schwarzbier is one of the longest continuously brewed beer styles in the world, with known ancestors close to three millennia in age. This lager’s deep, ruby-black color has a clean roasted edge due to its German malt complexity and it rounds out with hints of chocolate and coffee flavors. Schedule may vary slightly per taproom location.